AFTER a long recuperation after injury, American danseur noble David Hallberg will return to the ballet stage in December – in a place and a part not many would have anticipated. Hallberg will appear with The Australian Ballet during its Sydney Opera House pre-Christmas season, dancing the sunny, wayward Franz in Coppélia. It will be a role debut, for which four performances are scheduled: December 13, 16, 19 and 21. The AB’s artistic director, David McAllister, confirmed the dates. “We’re very excited to have him do his first shows [on his return from injury] with us,” he said. Hallberg’s choice of the AB for his return performances makes sense, in that AB staff have been involved in his rehabilitation over the past year or so. As for Coppélia, that’s just what the AB had on its schedule at the moment, but its cheerful, uncomplicated nature is perhaps a bonus. Hallberg will be able to have fun after an extended period of recovery. Hallberg, 34, had surgery on his left ankle in August 2014, which led him to cancel engagements for that year. Withdrawals from performances in 2015 were later announced. 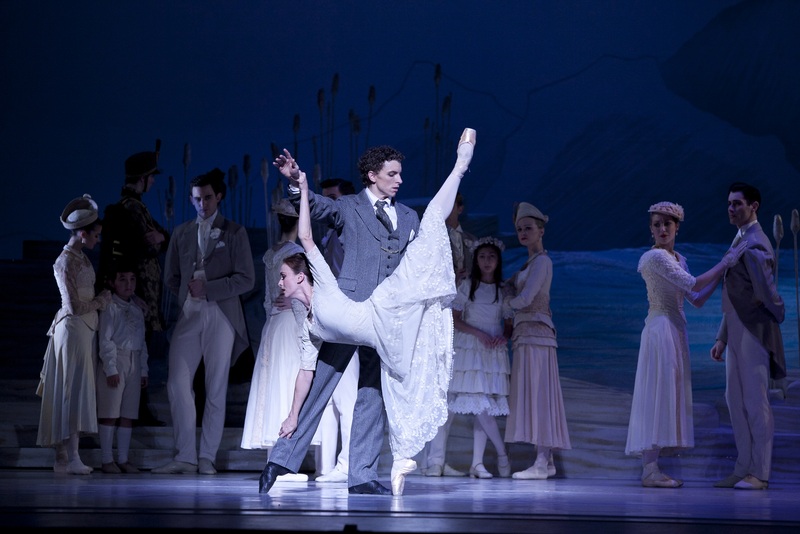 He is a principal artist with both American Ballet Theatre and the Bolshoi Ballet, joining the latter in 2011. He is the only American to be invited into the Bolshoi’s highest rank. Hallberg is also a sought-after guest artist and has formed a close connection with the AB. He first danced with the company in the Peter Wright Nutcracker in 2010 and was to have starred in the AB’s 50th anniversary gala in 2012, although injury prevented that engagement. He danced the role of the Prince in the new version of Cinderella created for the company by Alexei Ratmansky in 2013. Last year Hallberg devised a program called David Hallberg Presents: Legacy, which was presented during the 2015 Youth America Grand Prix. The AB was one of a handful of companies he selected to take part to illuminate their individual “texture, vocabulary and singular place in dance history”. These qualities will certainly be of use in Coppélia, but in a rather more light-hearted context than ballets already in Hallberg’s repertoire. Franz is a lively young man whose larrikin charm exceeds his mental acuity. Franz’s attention drifts from his fiancée Swanilda when he spots the apparently aloof Coppélia. Her lack of interest in him – chiefly because she is a life-size doll made by the mysterious Dr Coppelius – leads Franz into trouble from which the resourceful Swanilda must rescue him. They can then proceed with their wedding. At the AB the ballet is performed in a 1979 version based on the original choreography by Arthur Saint-Leon, as revised by Petipa and Cecchetti with additional choreography by Peggy van Praagh, the AB’s founding artistic director. Theatre director George Ogilvie “devised and directed” the production and has been involved in its restaging this year. Designs are by Kristian Fredrikson. WHEN Lucy Green stepped on to the stage at Wellington’s St James Theatre on July 21 it was in front of the toughest crowd imaginable. Dancers from every era of Royal New Zealand Ballet’s history were in town for the company’s 60th anniversary celebrations and they’d come en masse to a special matinee performance of Swan Lake. They would see a 22-year-old Australian who had made her debut in the double role of Odette-Odile only two days before. Many pairs of expert eyes would be assessing her every move. That’s not all. There were also television cameras in the wings, filming for the third series of the reality show about RNZB, The Secret Lives of Dancers, and those cameras weren’t around just to capture what used to be called Kodak moments. Green has been prominent in the first two series and knows only too well that drama and conflict are considered more entertaining, and that filming is stressful. It’s also relevant that last week Green was alternating with RNZB’s stellar principal guest artist Gillian Murphy, she of American Ballet Theatre fame and one of Swan Lake’s great exponents. These are circumstances to test any performer’s mettle but brutal as they may be, they sort out the women from the girls; the winners from the losers. By ballet’s end Green had won through. She had shown what RNZB’s artistic director, former American Ballet Theatre principal dancer Ethan Stiefel, calls her ability to “continually rise to the occasion”. Green is a quietly poised, thoughtful and modest young woman, aware of her good fortune and grateful for it. “I never, ever thought that I would ever get the opportunity and especially not at this age. It’s a role I never dared to think I would do,” she says. She has form, however. Also on her CV after just three years with RNZB is Giselle, which she danced on the company’s recent tour to China, and last year’s Cinderella. She is talented, a rising star, no doubt about it. But the thing everyone mentions about Green – the unromantic but necessary part of the equation – is that she has worked indefatigably for her success. This is the less thrilling but more truthful secret life of the dancer. Jenny Eldridge (“Miss Jenny”) says Lucy “focused, listened and concentrated from the word go. She was a beautiful child to teach.” Many years later Eldridge saw Green compete at the City of Sydney Eisteddford, in a solo from Giselle, and “the thing that captured me about her was that she was dancing from her heart”. Green found out she was being considered for Odette only eight weeks before her Swan Lake debut, having just returned from a three-week European holiday with her boyfriend, Rory Fairweather-Neylan, also a dancer with RNZB. It wasn’t the best preparation, she acknowledges, having not been able to take regular classes, but at least there was an eight-week rehearsal period ahead. The production being revived was that created by former RNZB artistic Russell Kerr, with designs by Kristian Fredrikson. As is the way with dance companies, the news was relayed via a list on the company noticeboard that had names, in alphabetical order, alongside various roles. Green was down to learn Odette-Odile as were three other company members. “We had no warning. It just went up one day, this is what you’re learning.” The fifth name on the list was Murphy’s. Engaged to Stiefel, Murphy spends a significant amount of time at RNZB. She is also one of Green’s great inspirations. Throughout the rehearsal period Green was getting a lot of coaching – unusually not from a former Odette but from Stiefel and ballet master Martin Vedel. “But we didn’t learn who was doing what when” until about two and a half weeks before opening. “There was always the hope, I guess. It’s a small company [34 dancers], so it was more likely than being in a big company of course. I had had a lot of encouragement about the roles I’d done previously so I was quite hopeful, but you never want to get your hopes up too much. Being far from the major ballet centres meant Green had to go to YouTube to see how others approach the role. “I remember watching these long, beautiful dancers with long classical lines, their legs go on forever, their arms are just like wings. I never thought I’d have those qualities. But yeah, here I am, and I’ve done it. I can’t believe it.” And while she was able to have only one orchestral rehearsal, she found Tchaikovsky’s music inspiring. “It’s got all the emotion and all the qualities you need,” she says. In a company of this size it’s not all Odette and Giselle, however: Green dances secondary roles too and gets few performances off. She dreams in the future of Juliet and Kenneth MacMillan’s Manon and of perhaps dancing in Europe, but in the immediate future, after Swan Lake, lies the biennial Tutus on Tour program that splits the company and takes ballet to small NZ centres where “you have one dressing room for 16 dancers, and you’re sharing a bathroom with the audience”. Swan Lake continues at various NZ centres until September 1. This is a slightly extended version of a profile that first appeared in The Australian on July 25.